As Matthew Stone has reported, a new study grading state’s education innovation came out recently. The study, conducted by the Center for American Progress, the American Enterprise Institute and the U.S. Chamber of Commerce. The study explored how well states fostered innovations such as charter schools, use of technology, and transparency to name a few criteria. Massachusetts ranked first. Kansas came last. How did Maine rank? Maine did rather well in some categories. Maine received a B on staff hiring and evaluation as well as preparing students for college or the workforce. The second is perhaps most important of Maine’s high marks. Since one of the goals of K-12 is to prepare students to jump straight into the labor pool or (hopefully) head to college we should be proud of this grade. The U.S. Chamber of Commerce congratulates Maine for offering high school diplomas with specializations, effective high school exams on college and career readiness, and on offering high school courses that also count as college credit. 60% of schools offer AP course in Maine. With our extensive laptop programs and great ITV system in K-12 and the UMaine system we should continue to expand that number to 100%. Giving Maine students a leg up so more a likely to seek degrees beyond high school should be one of our priorities. We have the technology. Let’s use it. Maine ranked among the middle of the pack in two areas. Maine received a C, or average score, in financing and on how difficult it is to fire ineffective teachers. The study found Maine’s funding mechanism to be simple and effective. They likely were suffering to the Essential Programs and Services funding model. While budget reports are available, they could certainly provide more information. There are no budget reports online after 2006-2007. It would also be handy if district budget reports were collected here as well. Steps like this could be taken, making it significantly easier to follow the money. 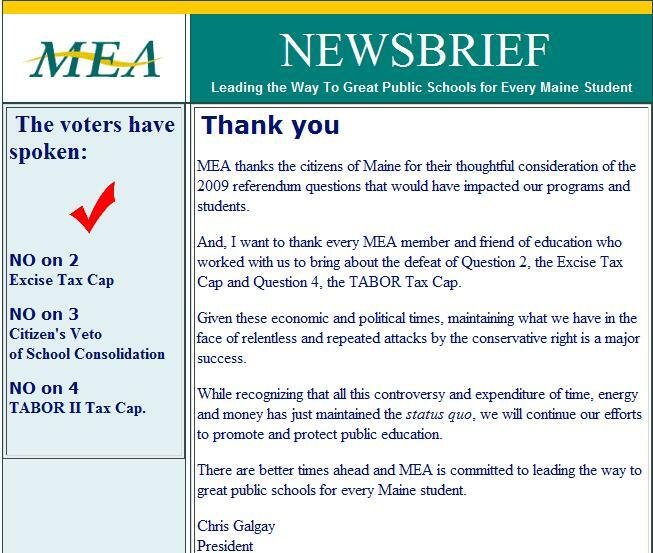 Maine also took a hit for neglecting performance pay (or merit pay) for teachers. I saved the worst news for last. The study gave Maine a D in three areas: school management, data, and technology. “Technology? Really?” you may be asking. “I thought we had this famous laptop program?” You’re right. I believe we do have one-to-one laptops in a higher percentage than any state. You can have a Hi-Def big screen, but if your still just rocking an antenna what’s the point? We have the technology, but if kids are just typing or doing research at Wikipedia (God help those students) then why bother spending the money? The study specifically cited lack of computer based assessment, lack of required tech testing for teachers, and poor evaluation of how well our tech investments are panning out. Again, we have the technology. Now let’s put it to work. Our longitudinal data systems were criticized for not following the P20 model recommended for the Race to the Top. The P20 data systems (PDF warning) collect student data on a variety of subjects in order to inform teachers, parents, administrators, and policy makers a student’s progress on college readiness and reports to catch problems with material early. A system like this would be absolutely beneficial to the Maine education system, so I can understand the D on data. Maine nearly failed in school management for two reasons. According to the study, 93% of Maine’s teachers say that they are bogged down by paper work and other routine duties. Maybe some teachers out there can confirm this? It would seem to me, that our students would be best served if teachers were freed from these tasks. They would be left with more time for student interaction, learning new methods and innovations, and well…teaching. The study slammed Maine for lacking any sort of charter school law. This is only one study. Considering it comes from a team of a liberal institute, a conservative institute, and a government organization, this may be one study Maine policy makers should pay attention to. The study has posted their own list of recommendations. With still looming budgetary issues, suggestions like funding reform and school management reforms should be looked into. One suggestion made by the study should not be ignored here: High-tech tools are of little use unless teachers in the trenches can take advantage of them. And yet again Maine takes a beating for not even considering charter schools. Maine is at a crossroads in many ways. Education is among the top concerns. We have an opportunity to make a real investment in innovation, in technology, and most of all Maine students. As in so many other areas, the world is moving forward. We can move ahead too, and take the lead. Or we can fall behind. Considering who will be left behind I don’t think that can be an option.